Upon cracking open a book and reading the first few sentences, sometimes it so happens that you instantly guess, and probably know, that the writer you are reading is, eventually enough, going to be the next great writer of this century, or maybe even centuries to come. Like Dostoevsky. Like Tolstoy. Like Joyce. Like Gogol. Like Kafka. Like Krasznahorkai- I suppose that won’t be a familiar name to many. It wasn’t, to me, until recently, when I read an interview of his in which the interviewer mentions- or rather asks- Krasznahorkai what book of his he would suggest to the reader who is, without having read or even heard of the writer before, directly coming to the interview. Krasznahorkai calmly (assumption) answers that they should pick up any of his books- there are only a handful in English- at random and start reading. Its easier said than done, though. For Laszlo Krasznahorkai may well be one of the greatest, and yet one of the most difficult writers to be read in this century and, like I said, consequently the next many. Its that easy a claim- that Krasznahorkai will be read and reread, that books, thesis, would be based on the study of his presentation of literature and that Professors- those unfortunate creatures- will be teaching his novels to students- equally unfortunate- across sad university classes (sad university classes, as it happens, might well be the best setting for a reading and analysis of a Krasznahorkai text). These are tall claims, but hugely simple to make when it comes to the famously reluctant Hungarian “master of apocalypse,” as Susan Sontag once called him, and rightly so. To be honest, cracking open a Krasznahorkai novel is not as easy as cracking open any other treatise (even Joyce’s might be a smoother beginning). One needs to be psychologically prepared for a journey that will- almost without any kind of hyperbole or overstatement being used- never stop. One of the components of the Hungarian novelist’s literature, the oeuvre he has carefully put together, is the fact that his sentences never cease flowing. The mysteries within his books are engulfed within the subsequently rapid and yet slowly enchanting flow of his sentences that can, at times, transcend chapters together. Like his wonderful and equally great translator, George Szirtes (who “trembled” at the thought of translating Satantango, Krasznahorkai’s masterpiece) said about Krasznahorkai’s prose, his is a writing that is “a slow, lava flow of narrative, a vast black river of type.” The translators of the writer are few and far in between, including some that limit their venturing into the Krasznahorkai universe by translating some of his shorter stories and essays- one of his essays on the emotion of anxiety is a little masterpiece that conveys to the reader the functioning within a chronically anxious mind- but they are people that do justice to the Krasznahorkai game of playing with readers’ mind through the vast spread of his sentences. Reading his book is like- if I am allowed my own metaphor here- sitting in a train that travels through an endless tunnel and is bound for nowhere- or maybe hell. That’s completely plausible, for Hell, such as the concept goes, features a lot in Krasznahorkai’s fiction. Hell and the idea that world will doom itself to destruction. This is no more evident than in Krasznahorkai’s 1989 novel, The Melancholy of Resistance, a dark tale of a small town encapsulating the bigger concerns of the World at large. The tale, one might note, is similar to R.K. Narayan’s The Man-Eater of Malgudi, for, not unlike Narayan’s masterpiece, the arrival of someone or something sparks off events that then go on to form the crux of the novel, and thus the crux of the themes that the novel wants us to understand. In Man-Eater its a single person within whom are the themes of the novel fixed; in Melancholy, however, its a circus, and the fantastical possibilities that the circus presents. The novel is a meditation on chaos and the possibility that, eventually, chaos of man against man will lead to the destruction of the human kind. Indeed, the theme is not unique to Krasznahorkai’s world, but the way destruction persists throughout the novelist’s prose and his delivery of the seemingly simple plot- through long, rambling sentences that will pull a patient reader into a trance- makes the reader aware of the fact that he is not just reading the chaos, but also feeling it. For Krasznahorkai’s prose is a simple act of anarchist dialogue- a dialogue directly addressing the reader, without breaks, or even the usual formalities in written sentences; a dialogue that breaks all barriers and rambles, and yet ends up making sense. Its a form of holding hostage the regular literature to hold captive the imagination of the reader. In The Melancholy of Resistance, arguably one of Krasznahorkai’s most difficult books (which is saying a lot), the writer provides to his reader a commentary on the human kind and a nudge on the post-Communist period in Hungary (even though the town in the novel remains unnamed, so does the nation or the period in which the story unfolds). The novel begins on a platform, a platform that signifies the reality of waiting, for the train we are supposed to be anticipating is late, but such a simple start won’t, of course, do justice to the start of a Krasznahorkai book- so Krasznahorkai propels us, immediately, into a kind of tension that begins from the first paragraph (except one or two, there are no paragraph breaks offered), and ends by the time we reach the final one, grasping for breath. Here again, as one of those waiting for the delayed train, Mrs. Plauf, frets over the possibility of reaching her destination late, Krasznahorkai digs into the troubles of an anxious reality. The first few instances, or images, rather- for there are no first few sentences; for the next 314 pages, only one sentence persists- also lead us into the future of the book, the theme of anxiety gradually slipping into chaos- and then eventually into destruction. The train leads Mrs. Plauf into a town that is soon to be put on edge by the arrival of a circus, the main attraction of which is a giant, dead whale (the image of which can be found on Krasznahorkai’s official Facebook page where he has, along with the pictures of his readings, interviews and events, also uploaded some enigmatic images that go along with some of his novels). The circus also brings along with it The Prince, a gibberish-speaking thug who is translated by a factotum, and who is also the catalyst of the chaos that would descend upon the town. Also introduced as one of the agents of destruction is Mrs. Eszter, estranged from her husband and first appearing before us as the lover of the town’s chief policeman, and then as one of those miserable characters Krasznahorkai revels in creating- a master of the anarchy, someone who can, without a second thought, use to her advantage the chaos and confusion that reigns in the town after The Prince and his band of lunatics start a riot (we are not told the reason of the violence, but one supposes that that’s a part of Krasznahorkai’s method of putting his readers in the bleakest and most confused possible turn of events). Perhaps, the premise of the book, and Krasznahorkai’s work, can be best explained by the lines that Valuska, one of the premier characters in Melancholy, utters in Bela Tarr’s adaptation of the book, titled Werkmeister Harmonies, when he says, as he explains to the common folk the cycle of immortality, “All I ask is that you step with me into the boundlessness where constancy, quietude, peace and infinite emptiness reigns. And just imagine that in this infinite sonorous silence, everywhere is an impenetrable darkness.” In this darkness, says Valuska, “we only experience general motion.” As he goes on explaining this treatise in immortality to the common folk that had, in the first place, urged him to “demonstrate” visually his theory, Valuska explains to us and the folk that will soon experience it the damnation of chaos and the structure of every Krasznahorkai work: that we, at first, fail to witness what is happening with the text, where the sentences are meaning to take us; but eventually, the text comes together to form what can undeniably be called a convincing picture of the evident apocalypse. Meanwhile, as Krasznahorkai creates wonders through words, Bela Tarr, the acclaimed film-maker, also of Hungarian origin, projects these wonders into a kind of visual reality. And no other director could have suited Krasznahorkai’s sprawling works for, as the writer composes sentences that are unflinchingly long, Tarr creates a cinema that is stretched and spread over various set of scenes and the various set of images that create a scene- examples of which are many, including Werkmeister Harmonies, but the greatest of which is the seven-hour long Satantango. A meditation on reality and the bleakness that persists throughout such a reality, Satantango is one of the most anguishing movies to have ever been made. I personally could handle only three hours of the black-and-white frames that seem never to have any end to them- the landscape and the mysteries that the landscapes grow from within them are all condensed within each frame, lasting several long minutes at times, and every frame proves that it is essential to the puzzle that the movie is. As one needs to be an intensely devout and if not that, patient reader, one meeds also to be very calm and diligent a viewer in order to make sense of a venture like Satantango. It would take a wholly different space and thousands of new words worth of addition if we were to concentrate upon the role that Tarr and his creation plays in Krasznahorkai’s work. Tarr and Krasznahorkai have collaborated on several ventures, the latter writing the script while the former weaving it into a slow narrative of images and long glances into the souls of the characters. It cannot be denied that Tarr has played a major role in cementing Krasznahorkai’s place in the world literature as the living master of bleak, relentless kind of literature that not many are writing, and won’t, probably, write. Their visions, however, entwine with what can unarguably be called Krasznhahorkai’s magnum opus- Satantango. Satantango first appeared in Hungarian in 1985 and its no surprise that it was soon considered to be the classic of Hungarian literature- which is saying something, especially when you have minds like Imre Kertesz, Peter Nadas and Peter Esterhazy, to exclude countless other notables, still working. The translation of the novel took almost three decades to complete, and one can instantly guess why- translating Krasznahorkai is unlike translating any other writer. To start with, the translator- the aforementioned George Szirtes, who is to be saluted for his daring decision to take up the translation in the first place- would have needed tackling the ever-expanding Hungarian language, where one thing might mean ten others, and ten things, consequently, might mean a hundred other phrases. Once that is done with, we come to the factor of the actual translating of the sentences and the vision that Krasznahorkai wants his Hungarian readers to understand. This vision of Krasznahorkai’s shall also be understood by his English readers and with that purpose, Szirtes needs to function. Hasty work on the novel might have ended up making it a book with “stream-of-conciousness” kind of prose that it absolutely isn’t. The sentences that flow within the text are not written out of a random burst of creativity- they are being composed and recomposed over and over again in the writer’s mind in a sort of inner dialogue that Krasznahorkai considers is important for the way his books turn out. The sentences are essentially reflections on how our mind functions; there are no commas and full stops involved, only the rapidly developing and the instantly dismantled jumble of thoughts and emotions within the complexities of a human mind. Krasznahorkai has sought to pick up the wreckage of positive and negative thoughts (but mostly the latter) that we think and compose them into textured sentences. This is what makes Sziters job a difficult one- what he essentially needs to do is to dismantle, again, these thoughts from the Hungarian, and then reassemble them in English. And such a process, as one can easily guess, is not advisable when it comes to Krasznahorkai, unless you want to turn yourself in to the challenges that contemporary world of translated literature offers (Sziters, of course, accepts such a challenge and rises above it, too). Satantango kicks off with the same allegorical atmosphere creation of The Melancholy of Resistance, and it traverses almost a similar path into the rain-drenched bleakness of the town where peasants dance in a trance, drunk to the core and yet dancing with their eyes hardly open; where the characters are never etched clearly enough for the reader to opine; where farmers are trying to steal from each other whatever they could; where isolated souls are seeking a way out of the depression that their current life has to offer and where, also, images, such as the girl trying to kill her cat and attempting her burial, create a screen of uneasy bleakness over the whole reading experience- making it, for me at least, all the more richer. Richer than, perhaps, watching the movie itself. This continues until the end of the first chapter, when the villagers are informed that Irimas, a man with certain “powers”, and his chum, Petrina, are making their way into the village. They are supposed to have long since died, but here they are, back alive, thanks, think the villagers, to Irimas’ extraordinary magical powers that had, in past, saved the village from the economic and social decay it had found itself to be in. The villagers hope that Irimas will work up his charm once again, and everything, including a developing scheme, is abounded. These supposed powers that the villagers have intense belief in, however, are also those that will later spell doom for them and the lives they were leading- but up until then, of course, the novel unfolds over us a sort of melancholic and desolation drenched textual rendering from which a reader can hardly emerge out- even when the last page of the novel has long since been read. Like the chapters in the novel- which run from one to six and then back again from six to one, thus lending the book the ‘tango’ of the title- Krasznahorkai, too, seems to be in the act of a tango with his readers, laying out a statement and then contradicting it- all this seems, strangely, darkly funny and yet knowingly miserable. Krasznahorkai wants his readers to understand that what he is writing is not feel-good, but the exact opposite of that. He is into devastation, and not just material, but also psychological, the one where the wreckage of the mind is harder to piece together than the ruins of the buildings. He wants his readers to understand that the universe is not just Earth moving around the sun and Moon moving around the Earth- the universe, in fact, is something beyond such scientific data. It comprises of people, and people lead to destruction, which is where he nods towards his notion of apocalypse. Krasznahorkai, as he has mentioned in interviews, doesn’t believe that the world is going to stay put; his perception that the world won’t even survive the next two centuries is hopeless, but then, even the current condition of the world, as he paints in his books, is full of decay and horror so that the next two centuries will eventually cease to matter. But even here Krasznahorkai plays a tango with his readers- while he has been, throughout his career, writing about destruction and desolation, he has also trained his guns towards the concept of beauty, and the presentation of this beauty through art. This he does in the latest novel of his to be translated, by Ottilie Mulzet and titled Seiobo There Below. The text is being touted as a novel, but I’d rather call it a magnificent collection of moments. For they are- call it a novel, or a collection of stories- nothing more than captured instances. Instances that are described in a prose that is lighter in vein than The Melancholy of Resistance and Satantango but gathers the same amount of pace and obsessions with sentence structuring. Seiobo There Below is a meditation on how beauty might cross out the ruins, or maybe even witnessing the beauty surrounding the devastation. The basic premise of the book is the lives and observations of several artists from across the world and across the ages of the world. The only link that joins them is the Japanese goddess Seiobo- also called, according to a Japanese legend, “Queen Mother of the West”; The Goddess, according to the same legend, cultivates a garden of peach trees that blossom only once every thousand years and the consumption of which leads to immorality- which possibly acts as the only method towards the madness that the novel is. Beautiful madness, but madness even so. Madness, one can say, that lies in the ruins and madness, one can claim, that only art can show us. What is different, however, with the novel is the fact that herein lies Krasznahorkai’s real concern- that art, as John Cheever once noted, is really the triumph over chaos. That art can, while functioning in its purest form, capture anything and everything, including devastations and ruins and, if one believes in the philosophy of insanity, even Hell, through all its subjectiveness. Such, said Cheever and such, says Krasznahorkai, is the power of the art; which is why the great Hungarian tries, in the tango that he does with his readers, to project the apocalypse along with the beauty- even though eventually, he claims, the former will end up triumphing over the latter. That apocalypse, says Krasznahorkai, is the ultimate fruit that the mankind will get for merely existing. It won’t be an overstatement, at this point of time, to say that Laszlo Krasznahorkai represents the contemporary Hungarian literature at world stage, and that he, like the other writers and novelists of the 21st century that have emerged in translation, has created a definition for the first half of this century. What makes his writing different, however, from, say Bolano’s or Danilo Kis’ is the fact that his work does not seem to represent political emotions that so many other writers emerging throughout the dust of post-war decades seem to engage in. The deep impact that the Central European politics laid down upon Central European men of literature cannot be particularly classified within Krasznahorkai’s writings. Of course, some sort of a character- more often than not the enigmatic central figure- plays a political parallel, but it is never quite clear whether Krasznahorkai seeks his readers to understand that what he is trying to imply by the character’s actions is a political equivalent. The Prince and Mrs. Eszter in The Melancholy are, of course, the torch-bearers of the sort of political anarchy that leaders not just of Central European nationalism put their nations into, but also the leaders all around the world that were consumed by their ideology into agents of destruction. Irimas and Petrina of Satantango might be seen as the agents that Hungarian Communist government often dispatched into rural areas, but Krasznahorkai does not explicitly mean to show us that- what he wants from us is, in fact, a more philosophical and psychological understanding of his characters and their actions, and then pin it across the social stage. He does not seek to make political commentary, for he is, above else, the writer of the humane. There are other books in the pipeline that are yet to be translated, and, like the ones presently available in English, they are all enchanting and yet notoriously difficult to fathom. The one novel of Krasznahorkai’s that I choose to exclude was War&War. The exclusion, of course, has a reason, and a simple one while we are at it- I haven’t read it. Not that I did not try and procure it, but I suppose my attempt was half-hearted. Be that as it may be, I have tried, in the best sense possible, to write about what I think Krasznahorkai is, and what I think Krasznahorkai will be. And even yet, I am not too sure I have expressed the man and his work in full because, as ashamed as I am to, I must admit to the fact that I am not the able person to analyse fully the texts that Krasznahorkai has offered to us- even the lazy critics that have often called his style of writing experimental or, if they are a little more enthusiastic, post-modern, are not the ones a reader should go by while trying to know what the great Hungarian master is trying to portray. Its all futile, if you go to look at it, futile and yet amazing how one writer, living and continuing to work, can leave a mark that continues to grow. 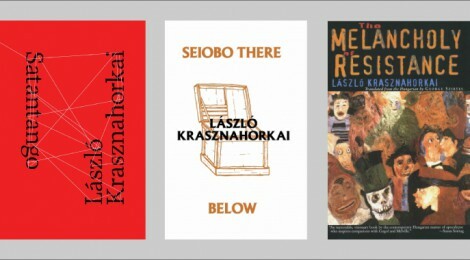 It might take decades- long after Krasznahorkai has passed- for critics and scholars to fully encapsulate the workings of Laszlo Krasznahorkai’s mind and the complexities of his text, but one has to read the writer as a person who will be, to put it mildly, one of the most important influences of the future of literature (if literature remains, that is, and Krasznahorkai believes that it won’t). For a Krasznahorkai reader, his novels, stories and essays will remain, always, an undecipherable open secret. He may well be the only writer who points his readers in the direction of the apocalypse and makes him believe that that direction is the only pathway to survival. Atharva Pandit is a FYBA student at Ramnarain Ruia College, Mumbai. His articles and essays have appeared in 'Youth ki Awaaz', 'Tinpahar' and 'Countercurrents' among other publications. Atharva currently serves as a weekly Columnist for 'The Indian Economist'.